For what it’s worth, this subsector was put together during a brief and ill-advised flirtation with T4 a long time ago. I don’t think there was anything in there that would make these hard to use with Classic Traveller or any other edition. But I could be wrong. In any case, you’ve been warned. 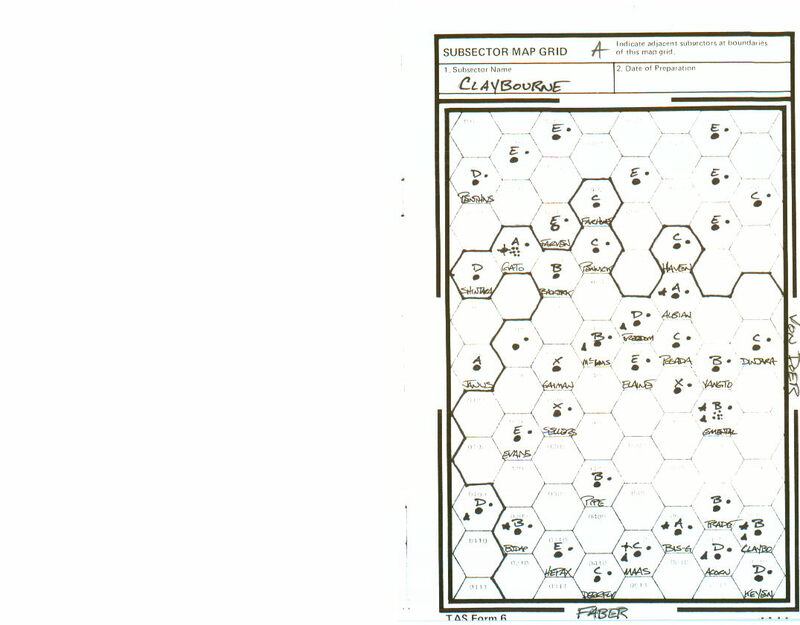 The Claybourne subsector occupies grid location A of the KOBE Sector. The fringeward and trailing boundaries of the Shardyn Alliance meet in the Claybourne. The Claybourne was named for Kenneth Claybourne, legendary explorer, statesman, and founding father of the Alliance. This entry was posted in Claybourne Subsector, Maps, Traveller on April 12, 2010 by the venomous pao. I have to admit to knowing next to nothing about Traveller, but being very intrigued. In your opinion, since Classic is hard to find, would T5 be a bad place to start? Ah, Traveller. Outside of TFT and Hero System/Champions stuff it’s probably the game I played the most (even more than D&D). It’s odd to think of someone not knowing it. But then the same could be said by others about me regarding, say, Runequest. By T5 I presume you mean the new Mongoose stuff. I haven’t really looked at that, so I can’t say for sure if it’s thumbs up or thumbs down. But I’ve heard generally good things about it from others, so you might be ok going for it. for PDFs. They’ve got the individual books on sale for cheap right now. Click through a few pages to get to the key CT books. You probably know already that 1,2, and 3 are all you really need to get going. Supplement 4 is a good add on, too. Oooh. I just noticed that they have The Traveller Book up as a PDF, too. That’s 1-3 in one file. Right now, with the sale on, it’s the same price as buying 1-3 individually, so it’s just a matter of preference: 1 file or multiple files? T5 isn’t Mongoose, but sort of sideways, in a way, if that makes sense. But then, I am not too read on the subject, but I read about the versions on Wikipedia. Ah, riiiight. T5 is the kinda concurrent with Mongoose (but not quite) version that may or may not happen. Here’s where I stand… I’m a loyal CT guy. I’ve never played New Era or 2300 or any of the other post-CTs except for the aforementioned brief flirtation with T4. T4 was a great idea, but it was the first RPG product I encountered where the editing was so bas as to be offensive. I’ve also run some GURPS Traveller, but my GURPS days are fairly well a thing of the past at this point. MongTrav kind of interests me, but on some level I just don’t see a reason to spend the money on a restatement of what I’ve got in my LBBs. I did pick up the reprint series of the Books and the Supplements a few years back for more immediate reference. And I suspect I’ll be grabbing some of those PDFs ‘ere long. Anyway, if I were looking to get into Traveller as a new guy I think I’d either dive in to MongTrav or drop some cash for the CT PDFs. But if T5 is what calls to you, I’m sure it’ll work just fine.